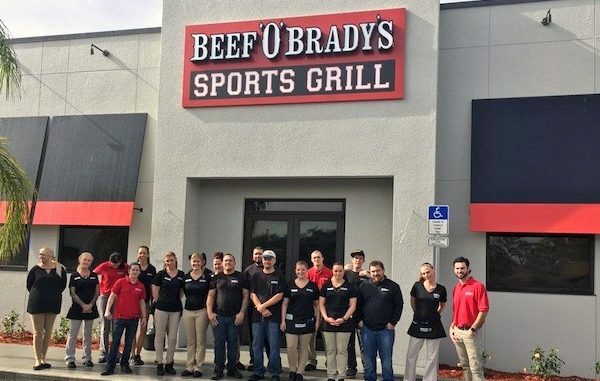 SEBASTIAN – Beef ‘O’ Brady’s is expanding and announced a Florida “re-develop.” The family sports pub plans on bringing 14 more locations to its headquarter state, starting with Vero Beach. The new restaurants will be pushing the remodeled restaurant design and a new, healthy menu refresh. “We have featured a few new grill items including steak, salmon and pork chops,” VP of Development Jamie Cecil told Sebastian Daily. Cecil said on top of the new layout, they have added a 65″ television to the remodel package in Vero Beach and Palm Bay locations. However, they don’t have a timeline for a remodel in Palm Bay. A few years ago, the Beef ‘O’ Brady’s in Sebastian and other Florida cities closed after the economic downturn caused by the housing market. But now the chain is once again expanding after announcing strong earnings in 2018. We asked if there might be a Beef ‘O’ Brady’s coming to Sebastian. “We have already completed ten successful restaurant remodels throughout Florida, including our corporate locations, and are excited to continue to support growth of our existing locations throughout the state,” Cecil said. Sebastian has a lot of land and corporations from many chains have been looking in our city to develop. It’s possible that Beef ‘O’ Brady’s is one of them, but like all others, they will keep it quiet until they are ready to announce. The Tampa-based company already has 18 successful locations throughout Florida, and they are hoping for Vero Beach to be just as successful. With the development and movement into Vero Beach, they see the potential for families to fall in love with the redesigned model. Recently, the Beef ‘O’Brady’s in Viera (north of Palm Bay/Melbourne) has gone through new renovations. Next on the list will be Vero Beach, and with that, a lot of new jobs. To find out more information and its menus, visit the Beef ‘O’Brady’s website.